Wheat researchers from around the globe will be coming to Sydney in September for the 9th International Wheat Conference website. 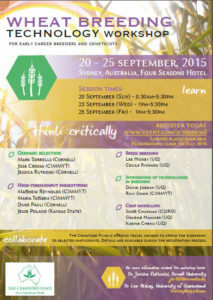 A number of training and other workshops are being held at the time of the conference, including a workshop on wheat breeding technologies for early career breeders and geneticists that will be run across 3 sessions spanning 20-25th September 2015 in Sydney, Australia. This workshop coincides with the Conference and the Borlaug Global Rust Initiative (BGRI) 2015 Technical Workshop events. As part of our training program and to foster cooperation with scientists from developing countries, the Crawford Fund is offering a limited number of grants for suitably qualified candidates to facilitate their participation in the International Wheat Conference and the Wheat Breeding Technology Workshop. Applicants should be early to mid-career scientists from a developing country actively engaged in wheat and or barley research. Further details are available during the registration process. These grants are part of the Crawford Fund’s activities to increase engagement in international agricultural research and in particular to foster cooperation with scientists from the developing countries. Attending the International Wheat Conference and the Wheat Breeding Technology Workshop will afford the opportunity for developing country scientists with a demonstrated professional interest in wheat breeding to benefit from discovering emerging science on cereal research in Australia and globally. The Fund is also pleased to be a supporter of both the Wheat Conference and the BGRI Workshop through our assistance with the media effort underway for both events.